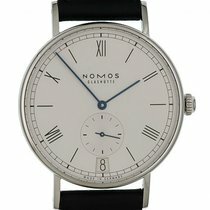 This NOMOS watch has the self-winding Epsilon caliber in-house movement created in Glashütte Germany. 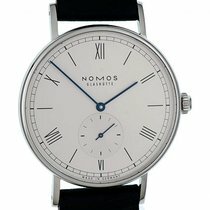 A beautiful watch: a little larger (and thus a tick more modern) than the hand-wound classic model. 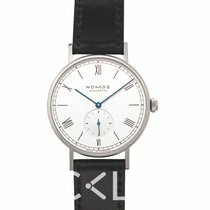 But it has the same white, silver-plated dial. Underneath it, the rotor steadily works away, keeping time.